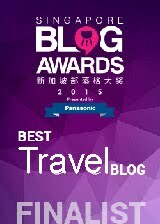 Of the more than 200 country pavilions and themed pavilions, I visited only 30 of them. That’s less than a quarter of this phenomenal event, but it was still plenty to experience, record and learn from. 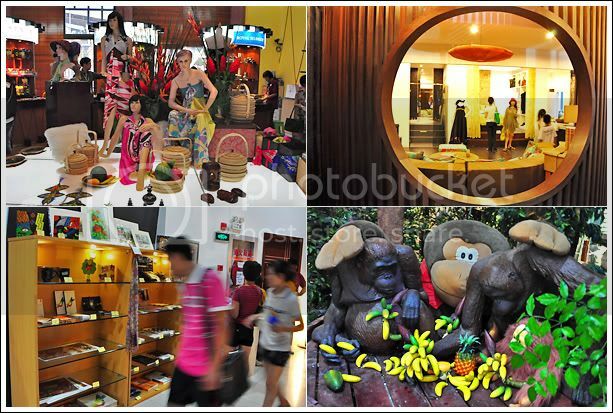 So since I started talking about the country pavilions with Singapore’s participation, I thought I’d follow up with a review of the pavilions by the other 9 members of the Association of South-East Asian Nations (ASEAN) – Malaysia, Brunei, Indonesia, Philippines, Thailand, Vietnam, Laos, Cambodia, and Myanmar. As with the thoughts about the Singapore Pavilion and all subsequent posts about pavilions, I have to qualify that the opinions expressed are merely based on my personal experiences as a visitor. Just as we all have a different vision of what a perfect world should be, so will opinions vary on what makes a pavilion worthy of visit. 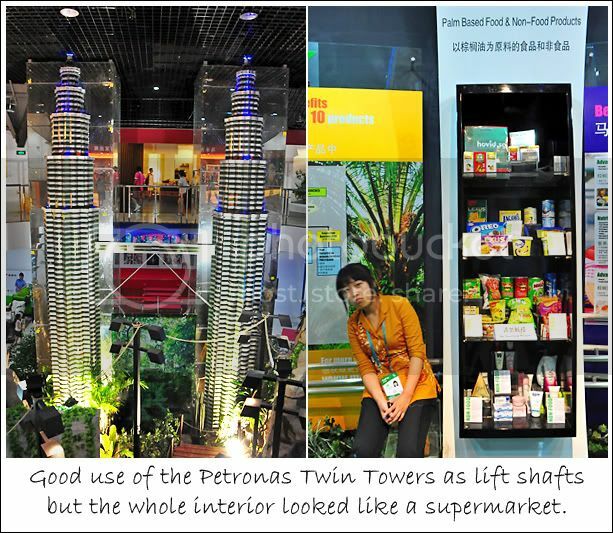 While some pavilions left a lasting impression on me, others failed to pique my interest. And having seen 30 of them, my basis of comparison while limited, draws on after-thoughts about what was interesting and what was as interesting as watching paint dry. 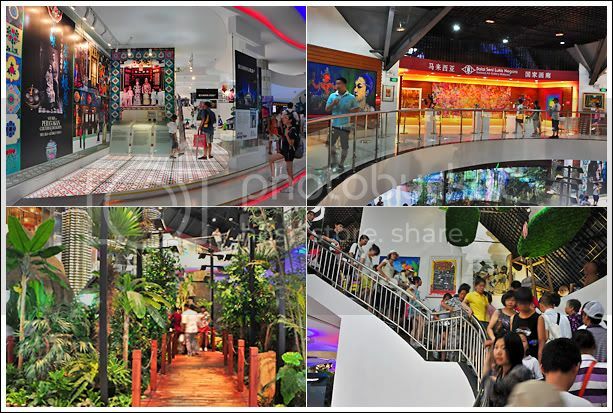 My very first step on the pavilion arena on the very first morning was at Zone B’s Asian Square. 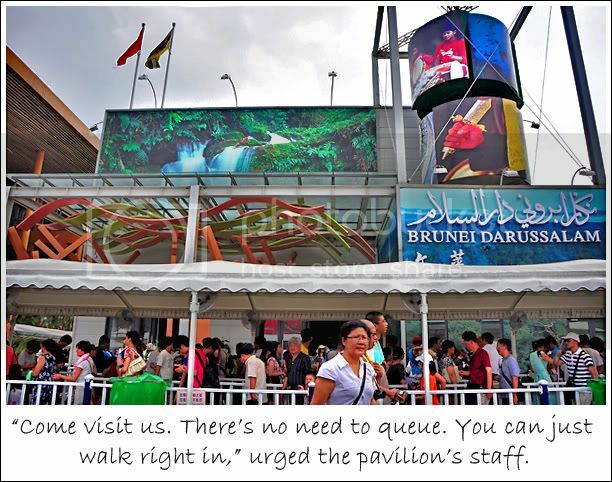 The Singapore Pavilion was directly across and I was next to the Brunei Pavilion. While I was standing there, stopped in my tracks by encountering the larger-than-life pavilions for the first time, trying to comprehend the awesomeness of size and space all around, forgetting to breathe… and my reverie got interrupted by a female voice hawking a pavilion. Sounded almost like a lelong at a pasar malam. 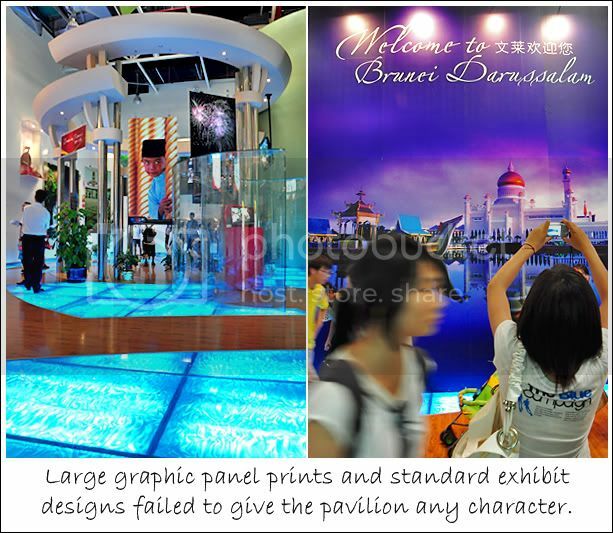 In all my 3.5 days visiting the Expo, I didn’t hear any other pavilion being touted this way. 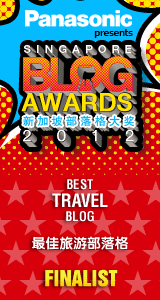 I didn’t succumb to the tempting invitation of ‘no queue’ and visited Singapore first. When I returned to visit Brunei after lunch, there was still no queue. And the female staff was still advertising. I walked right in to Brunei Pavilion and I liked it. It was a burning 38°C outside and I liked that the spaciousness and lack of crowd kept the air-conditioning cold. Yup, that’s about it. The pavilion was good only for enjoying some air-con. After I went one round of its exhibits, I understood why there was no queue. There wasn’t anything much to see. The pavilion was bright and neat with the deployment of standard exhibition panels, shelves and plasma TVs to loop touristy videos. 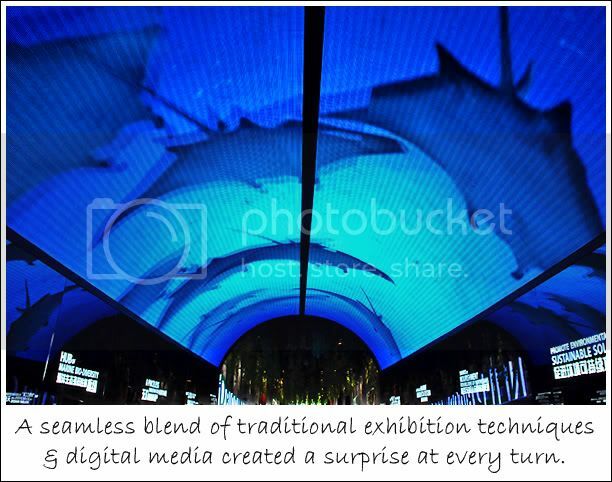 The one eye-catching thing was the blue-lighted floor designs that I assume represented water since the pavilion’s theme was something to do with nature. Brunei is a pretty rich country so it’s kinda surprising that the pavilion looked like it didn’t require much financial effort. 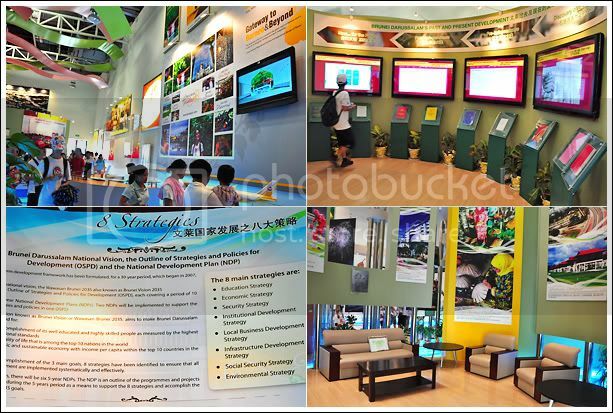 Moreover, the choice of exhibition topics such as the plain listing of the 8 national strategies of development was too academic. 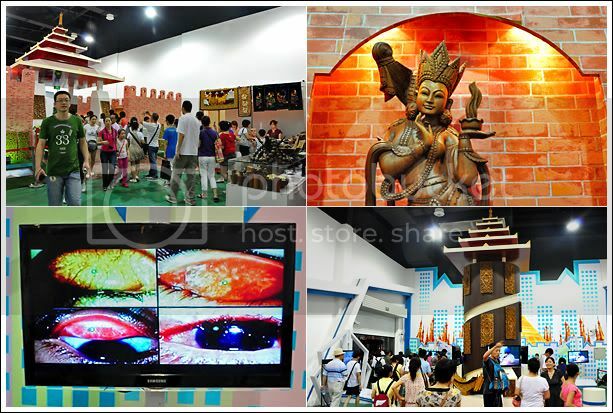 Laos shared a pavilion with Myanmar in Zone B's Asia Joint Pavilion III. I was there around 9:00 pm and it was closed by then. I hadn't planned to visit the 2 pavilions but wandered into their shared space unwittingly. Though I didn't get to see what's inside, the attempt to dress-up and represent its culture at the entrance even though it's just a very small exhibition area seemed to hold a promise of not too shabby contents inside. 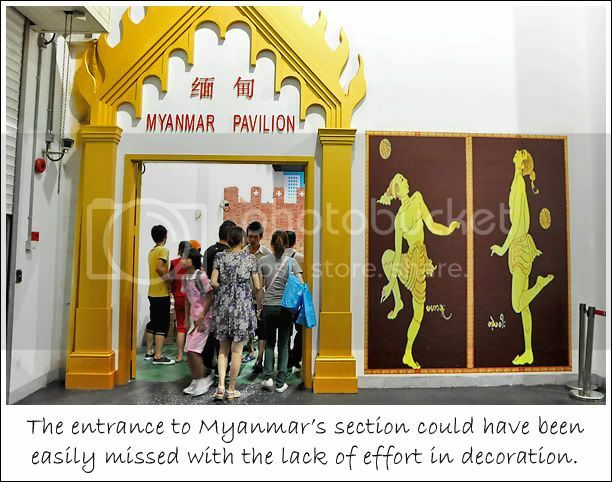 I popped by Myanmar's section on the way out of AJPIII and it was really plain. It felt more like an exhibition booth rather than to be classified as a pavilion. I always have a soft spot for Myanmar because of the controversy surrounding Aung San Suu Kyi's 14 years of house arrest imposed by the Burmese military junta. I hope to visit the home country of this moder-day freedom fighter one day. One of the 4 Southeast Asian nations with the unsavoury association to the Golden Triangle (an illegal opium-producing area that spans Vietnam, Laos, Thailand, and Myanmar), the country's culture is greatly influenced by its surrounding neighbours, especially in religion. 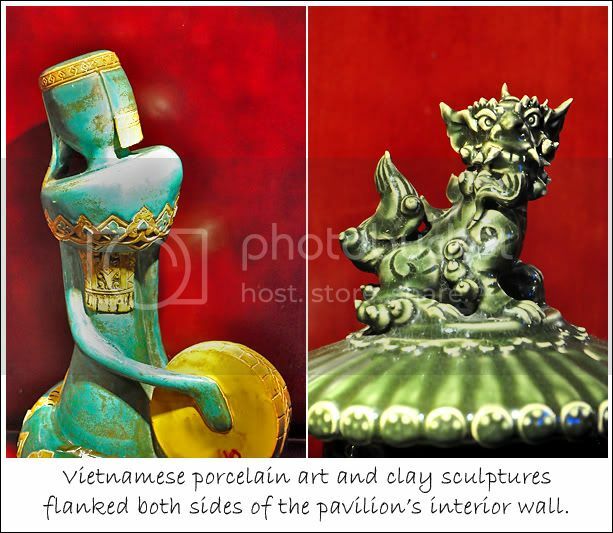 One of the most interesting things to see at the pavilion was the intricate wood carvings of celestial beings and Taoist deities such as Nuwa (女媧), who's believed to have made mankind from clay. However, their display couldn't have been more inappropriate. They were really beautiful works of art crowded unceremoniously together on shelves and on the floor. But the most atonishing exhibit of all would be the brutal honesty in presenting the nation's health program. I can't hear what was being said but the uncomfortable images depicting surgery and various stages of eye diseases really stood out at the World Expo where only beauty has a place in the sun. When contemplating the Malaysia Pavilion, this saying kept flashing in my mind… “Good from far, far from good.” In a distance, its arches bit an impressive crescent against the skyline. But the closer I got, the more it loses its magic. And once inside, I kept having the urge to look for a shopping basket or trolley. Felt like I entered Carrefour. 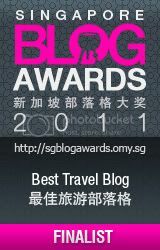 Being a bridge away from Singapore, Malaysia is my most visited country. And I like going there for its eclectic conglomeration of urban built-ups dipping their feet in the rooted heritage of colonial structures, old shophouses and five-foot ways. Of course Singapore has this kind of scene too, but in Malaysia, it just feels more authentic. Besides, our neighbour has lots of natural, untamed reserves to explore. 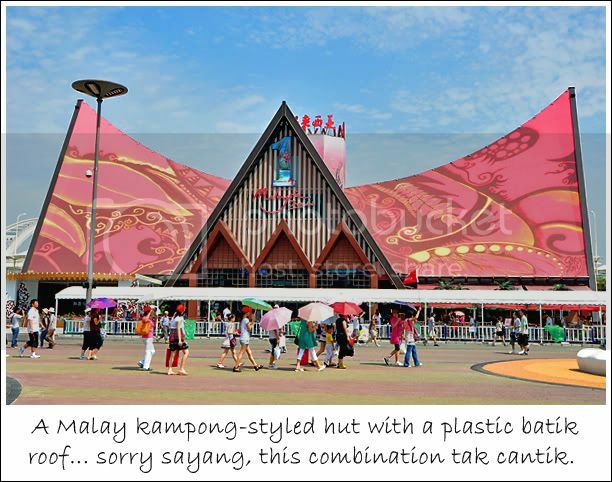 I can see that the pavilion tried to capture Malaysia's multi-faceted charm. Unfortunately, it turned out to be nasi lemak without the coconut milk; it had the look, but not the flavor. There’re too many prints and not enough real artefacts. 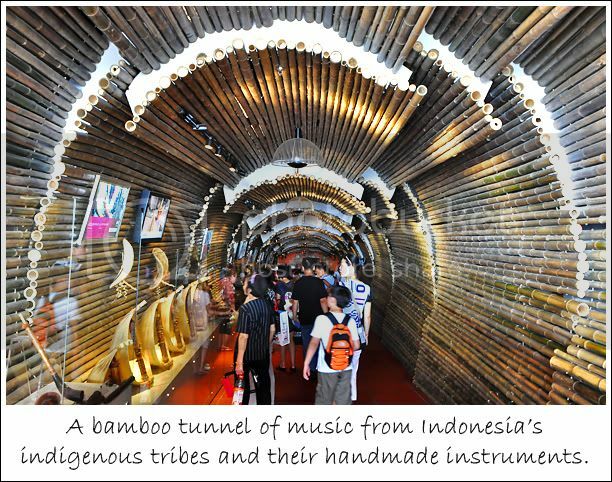 Even the ‘forest’ was made up of plastic trees and plants which made it look more of a handicrafts store, less of a tropical rainforest paradise. When visiting the pavilion, one of the interior plan that made me scratch my head was a staircase linking the first floor to the second. It’s one staircase for going up and down so it got pretty crowded and I was stuck in the human traffic for a while half-way up the steps. Such a smart design. Or maybe the creators didn’t anticipate such a huge crowd. The 2nd level was somewhat of a cocoa showroom with some half-baked exhibit to explain the cocoa-making process and a cocoa drink sampling counter. Sales was brisk. Moving from the supermarket section of the pavilion, we come to the home and décor section with a stylishly designed modern-Malaysian living room, bedroom and bathroom. There was another small exhibition of art and craft that seem like an afterthought, and more retail and souvenir counters around. The pavilion’s theme was 1 Malaysia. Well, it sure was the 1 place to shop. Here’s a diamond in the rough. The pavilion’s exterior was nothing to shout about but the interior was lavish with the cream of what put Cambodia on the tourist map. Perhaps that’s the strategy of the pavilion, to trick visitors into having low expectations and then wow them. Although more could have been done to hide the exposed ceiling to create a more engrossing feeling of being Lara Croft, but the thrill of seeing partial replicas of the famous architectural relics in Siem Reap made up for it. 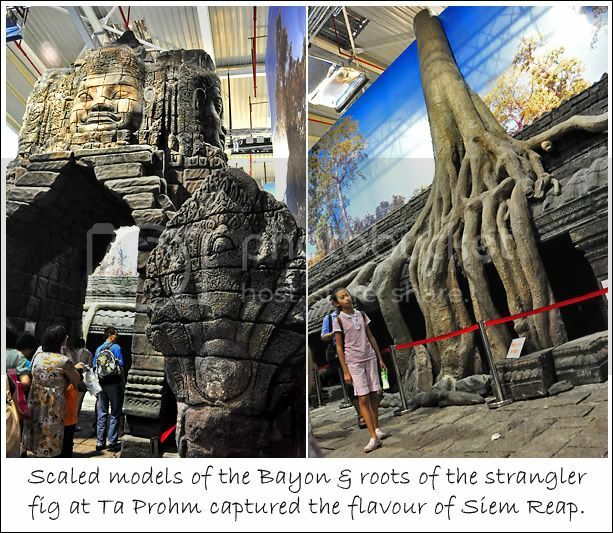 There was the Cambodian Naga, the smiling face from the Bayon, the gigantic roots of a strangler fig at Ta Prohm, and a model of Angkor Wat. It momentarily brought back memories of Siem Reap through the excitement of recognizing what was being replicated. 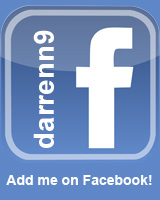 If you would like to know about my Siem Reap adventures, please click here. 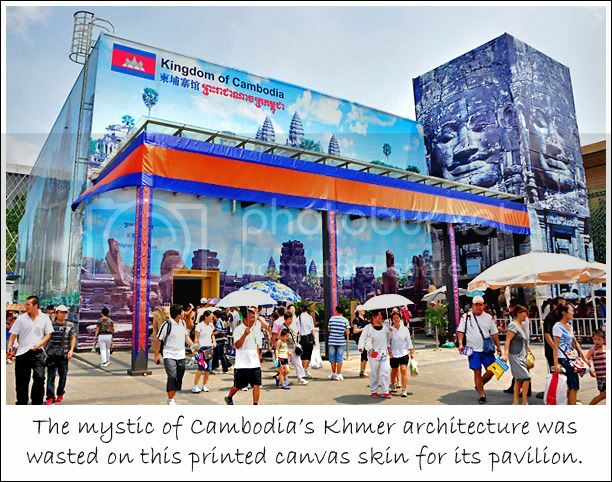 While the Cambodia Pavilion wasn’t very big, it really gave visitors a glimpse of what’s it like to visit its many UNESCO World Heritage sites of towering temples and ancient carvings. Even the small space within the pavilion worked to its advantage because that’s how it felt within the walls of the ancient structures. The pavilion was a time capsule. 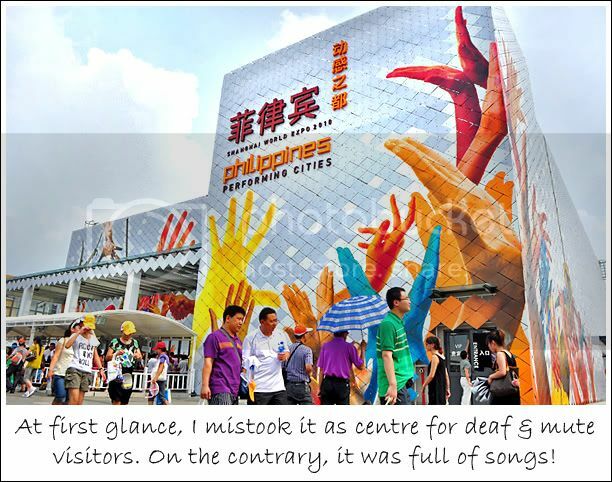 When I first glanced around the Asian Square, I thought the Philippines Pavilion was actually an administrative centre for deaf and mute visitors because of the hands printed on the walls. I mistook them for sign language. Then I realised it was Philippines' pavilion to the theme of Performing Cities. The pavilion design looked rather bland during the day. 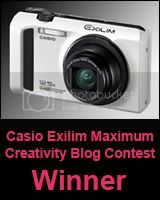 Even when it was lighted up at night, it didn't have any jaw-dropping effect. There wasn't a queue so I got in pretty quickly and it immediately felt like I entered a club or live band lounge of some kind. Serve up some alcoholic concoctions and the whole experience would be perfect! Sitting next to the AJPIII (which housed Laos and Myanmar's pavilions) in zone B, Vietnam's pavilion was easily the most impressive in terms of building material. The quaint little pavilion made up of bamboo and rattan incites a sort of calm without the use of minimalism, a visual style that often personifies Zen. I hadn't planned on visiting Vietnam Pavilion but it turned out to be a very pleasant and delightful encounter. 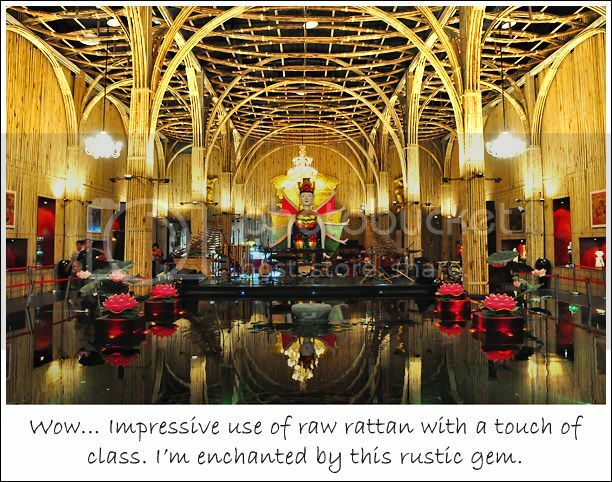 I simply love the way it looked on the outside and inside (although the interior did remind me of a prayer hall). 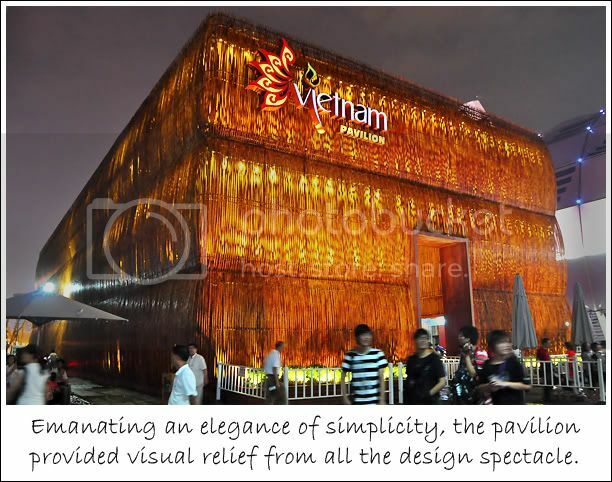 There was practically nothing to read in the pavilion about Vietnam except for the interpretative messages about its culture from the many huge vases and art sculptures. 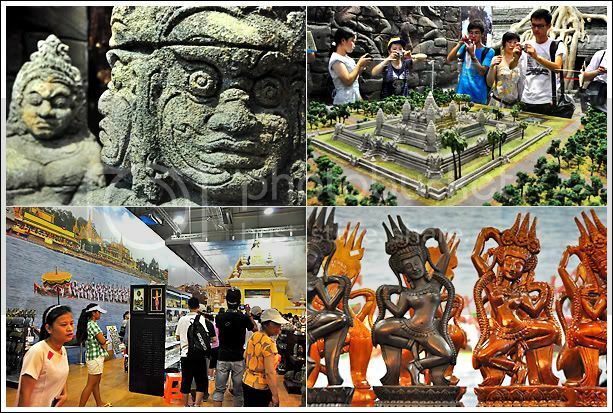 Somehow, I can't help but feel that the Vietnamese preferred not to pen down a definition of what is life, but to let it be an open exploration with each visitor forming his/her own meaning through the country's pieces of art. But one thing's for sure, religion plays a big part. 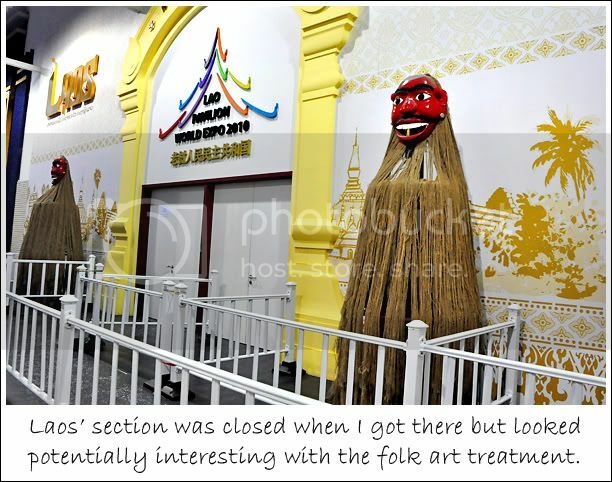 My first impression was that the Indonesian pavilion looked kinda bare with a whole lot of empty space. The open concept defied my early preconceived image of what a pavilion should look like... that it should have 4 walls enclosing all exhibits and design elements. But the pavilion was hollowed out for outsiders to look into its various levels and layout. 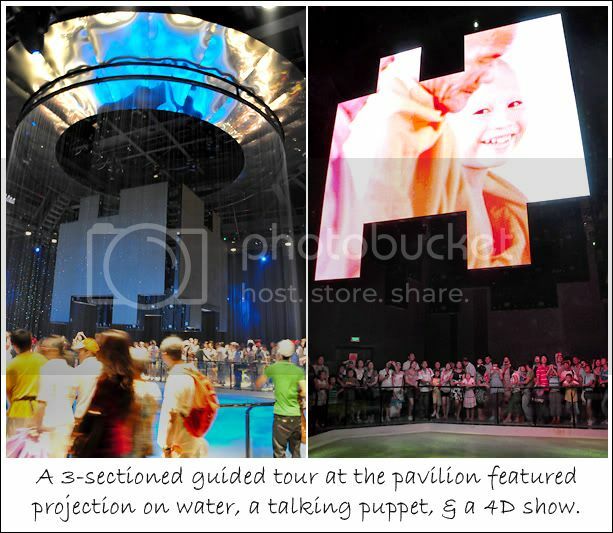 With so much 'empty space', I imagined that the pavilion won't have much to showcase, but the pavilion was one of the more interesting ones to visit in terms of the richness of content and variety of exhibitory techniques. There was a surprise at every turn! At 4-storeys, the pavilion was the tallest at the Asian Square and was really effective in communicating its environmental leanings. 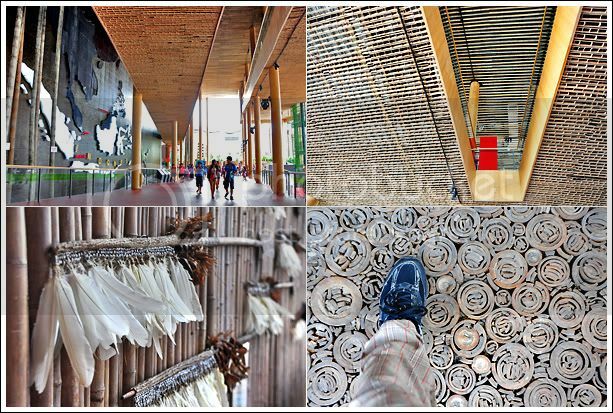 An interesting feature was the combination of various natural building materials such as bamboo, palm leaves, and wood chips for the pavilion's walls, flooring and some fixtures. 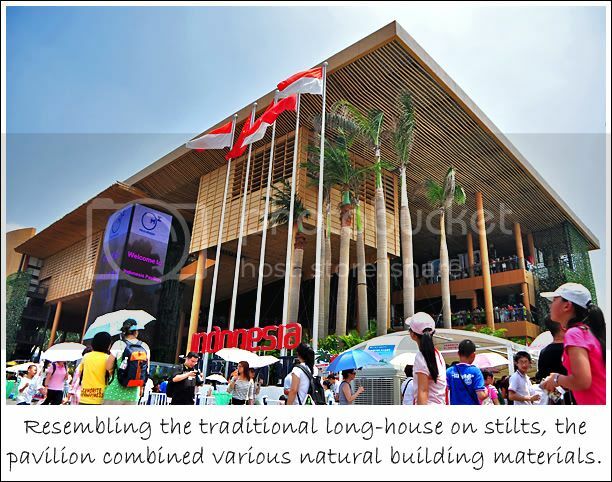 Of all the pavilions, I thought Indonesia was the most successful in synthesizing nature with technology to create a seamless journey in discovering Indonesia's native natural-scapes as well as digital edge. 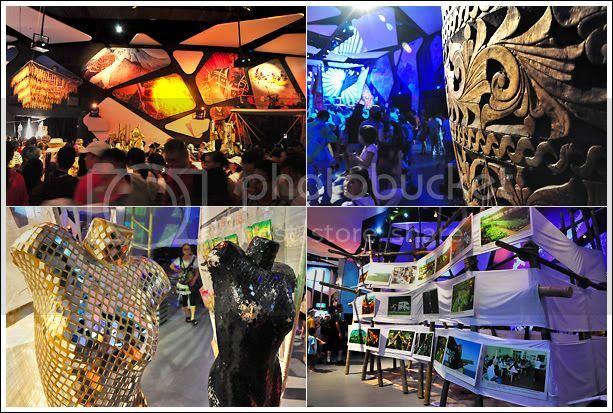 The Thai pavilion was my favourite amongst the ASEAN gathering in terms of entertainment value, ability to wow, and leaving a lasting impression. A guided visit with 3 shows in 3 different theatrical format, the pavilion was definitely worth the 2-hours queue time. Once visitors entered the pavilion, they were greeted by an animation of the pavilion's mascot, Tai, while waiting for the first theatre doors to open. 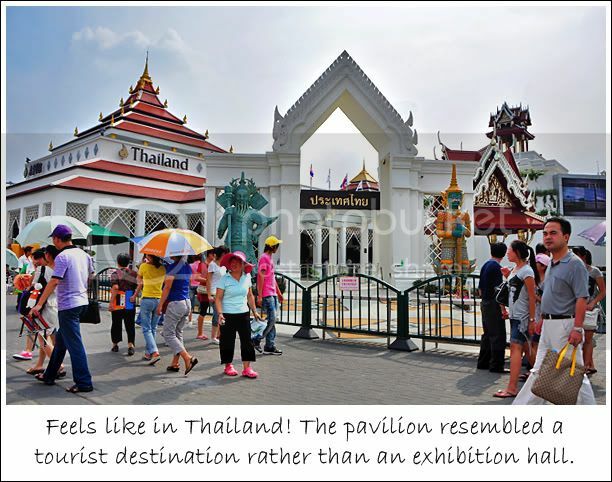 It endeared itself to the visitors through a very lively but brief introduction about Thailand and the pavilion. 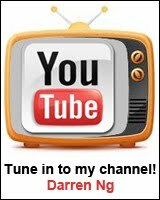 Tai appeared again later in another show segment about Thai history and diplomatic ties with China. When I stepped into the first theatre, I could hear grasps. Before us was a large water curtain cascading into a pool below. The sound of water splashing filled the room. The show was projected onto 4 screens shaped like jigsaw pieces (although I felt the odd shape wasn't necessary) in the middle and onto the pool. 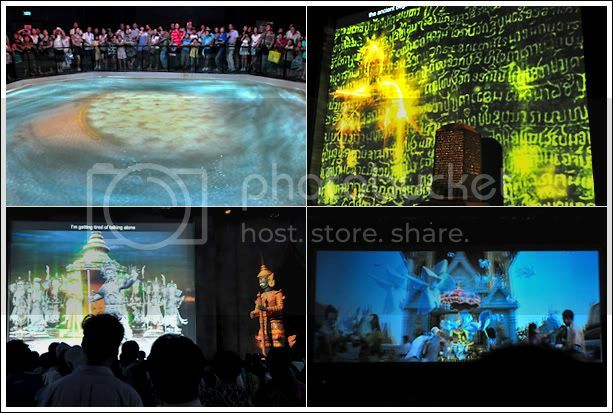 After the show, we were directed to a second theatre that featured projection on 3 sides and a huge, animatronic puppet Indrajit, the mythological warrior that stands guard at the entrances of many Thai temples. The interesting part about this second show was the interaction between the puppet with the projected animation of Tai and what looked like Guan Gong, the Chinese god of war. The 3 characters talked to each other and created a multi-textured presentation. The last theatre played a 4D show. We're all familiar with 3D by now and the fourth D is the addition of real physical experiences that complimented a show's content. In Thailand's case, I felt wind blowing in my face when the show talked about beaches, sprinkles of water when the scene showed rain, and the smell of fragrant jasmines when a basket of the flower was tossed into the air. 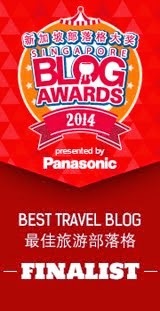 Amazing experience! Love the pavilion as much as I love visiting Thailand.